D esigned to beautify any window area, this butterfly and hoop Matashi crystal ornament comes complete with two clear Mastashi crystals designed to catch and redistribute light and add real sparkle to any living area. Simple but elegant, this piece isn’t movable, however, movement is implied by the position of the 24 carat gold plated butterfly as it heads toward and through the hoop section of the ornament. Perfect for cabinet or window display, this Matashi crystal piece also makes an excellent starter piece for collectors. Small but elegant, the butterfly and hoop set add a sense of movement and curiosity to home and living spaces. Set into the wings, the two Matashi crystals draw the eye to the ornament making the piece ideal for use as a conversation starter and perfect for display in high traffic home areas. 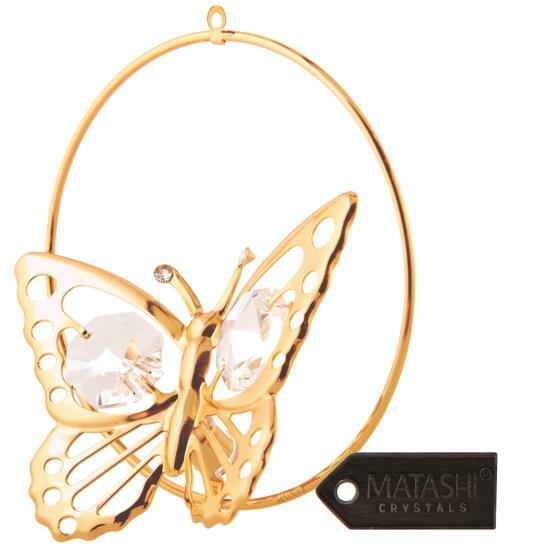 Just like with all of our Matashi Crystal pieces, our Butterfly & Hoop hanging ornament is protected by the Matashi Crystal ‘Civil Promise.’ This means that if your ornament or any piece of jewelry which you purchase from us arrives damaged or with manufacture defects, we’ll repair or replace the piece in question. See our website for full details. Dimensions: 2.75 (L) x 2.75 (H) x 0.75 (W) Inches. Get 30% off on your first order!